There are times in life when calling for professional help is more than necessary. Even if you can do some things on your own, sometimes it is much more beneficial to allow someone else to do it for you so that you don’t have to worry about anything. If you are moving to Fitzrovia, W1 you may be facing precisely this kind of situation and you should definitely take into consideration the fact that calling for a professional removals company should be among your options. In fact, it may actually be the very best option you have, considering the fact that you should make sure that everything you own gets to its destination in one piece and considering the fact that you will definitely want to avoid any kind of accidents that may harm you or those who are helping you move. A professional company will deal with everything the proper way and they will safely carry and transport your belongings to the new place. Even more than that, they may also be able to help you with packing, with cleaning up the packaging materials and with other services related to moving to W1 area as well. If you are searching for an excellent moving service provider in the area, do not hesitate to call Moving Service on 020 8746 4402. We will be more than happy to assist you! As someone moving in the area, you must be quite excited about it. This particular neighborhood in Central London is among the most appreciated ones and everyone who lives here should consider themselves to be quite lucky. 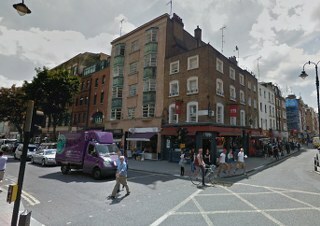 The neighborhood is located north of famous Soho (and quite close to it as well) and it is divided between the City of Westminster and the London Borough of Camden. The name of this area is believed to have originated in “Fitzroy’s Tavern”, a public house that used to be quite popular in the area. The neighborhood itself formed around the tavern and at the beginning of the 20th century, it was already quite famous. In fact, some of the most famous names in history and culture of the UK have lived here, including Virginia Woolf and George Bernard Shaw. Leaving fame aside though, the neighborhood is perfect for everyone, from young people who like having fun to business people and to people moving in with their families. The perfect mix between culture, leisure, entertainment, education and business charms many people and attracts them into moving here. Moving Service is a professional removals services provider in Fitzrovia , W1 that can help you move away without having to face the stress that comes with this. We understand it very well that people want their personal belongings to be safe and secure and we also understand that people would rather work with a crew of man and van movers that really knows how to do things. For this reason, we will bring together the best movers around WC1 area (as many as you need), the best equipment and the best know-how we have to be of service to you. We will do it with passion, dedication and reliability precisely because we believe in doing things pleasantly and properly at the same time. Contact us on 020 8746 4402 and an amiable customer representative will answer you all the questions you may have in relation to our services. And if you want to find out more about how to move without stressing about it, come and read our tips and tricks – we have collected them from the best in the business.